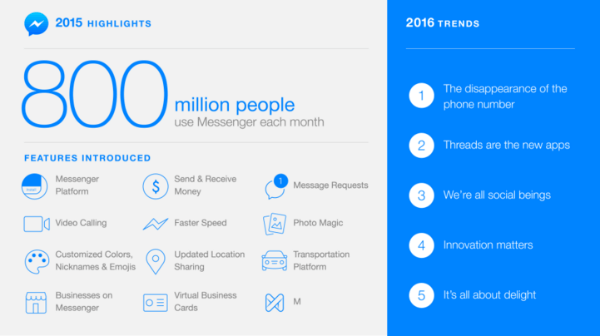 Facebook Messenger Passes 800 Million Active Users per Month: Facebook, which “crossed the milestone of 800 million people using Messenger each month” and has made “significant improvements to how [it enables] people to communicate” in 2015, outlined its plans for Messenger in 2016. Facebook Transitions Ad Serving Customers Away From LiveRail: Facebook announced that it “will no longer be accepting new customers for LiveRail’s ad server [and] will help all existing LiveRail ad serving customers transition over to [its] other publisher products or alternative ad servers” over the coming months. In this blab from January 8, 2016, Michael Stelzner and guests discuss the top news in social media. Topics include speculation over an increased character limit on Twitter (2:03), Facebook testing secondary categories in the mobile news feed (18:30) and Twitter’s new conversational ads (38:13). Subscribe to future shows here. In this episode tech and tools expert Steve Dotto explores How to Grow Your Twitter Following Automatically With Social Quant. 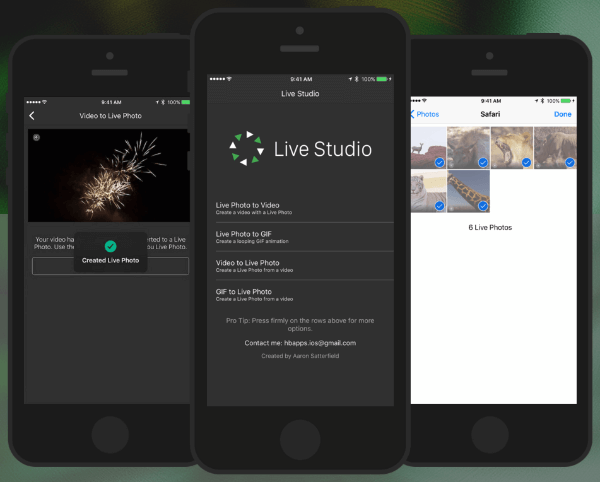 Live Studio: This iOS app quickly converts videos and GIFs into live photos or live photos into GIFs and video and shares them online. Slash Mobile Keyboard: This free iPhone keyboard integrates messaging, search and content sharing from other platforms into one place. It also suggests nearby businesses or restaurants you might like to try based on what you type. Snapchat Closes Lens Store: Snapchat closed its Lens Store and plans to “focus on advertising, including sponsored lenses branded with movies or products.” Users will still be “able to choose from 10 free lenses to use each day” and retain any paid lenses already purchased. Socialbakers News Feed Research: A recent independent Socialbakers study on the Facebook news feed reveals that 24-29% of the typical news feed contains page content from brands, celebrities, public figures or organizations. The study discovered that 10% of the page posts tend to be sponsored, which means that 3% of the typical user’s Facebook feed is promoted content and that engagement on media and publisher content nearly doubled in the last year. Facebook 2015 Year in Review: Facebook analyzed the past year’s conversation and ranked the most discussed global topics and top check-ins, movies, TV shows, entertainers, athletes, places and games around the world. Native Advertising and Endorsement: Research participants were shown two versions of the same advertorial content: one with a photo of the endorser in front of a plain white background and one with the same woman in front of a blue wall of products. Sixty percent of respondents who saw the same woman in front of a wall of products perceived the advice as coming from a “medical expert,” versus 23% who saw the same photo with just a plain white background. In terms of content, 27% of respondents thought the ad could have been written by journalists or editors of the website. 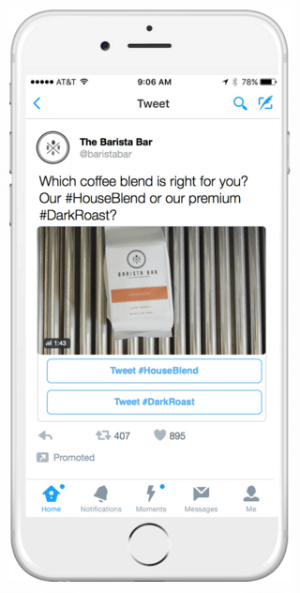 What do you think of Twitter’s new conversational ads? Have you tried using them to engage with a brand on Twitter? Please share your comments below. 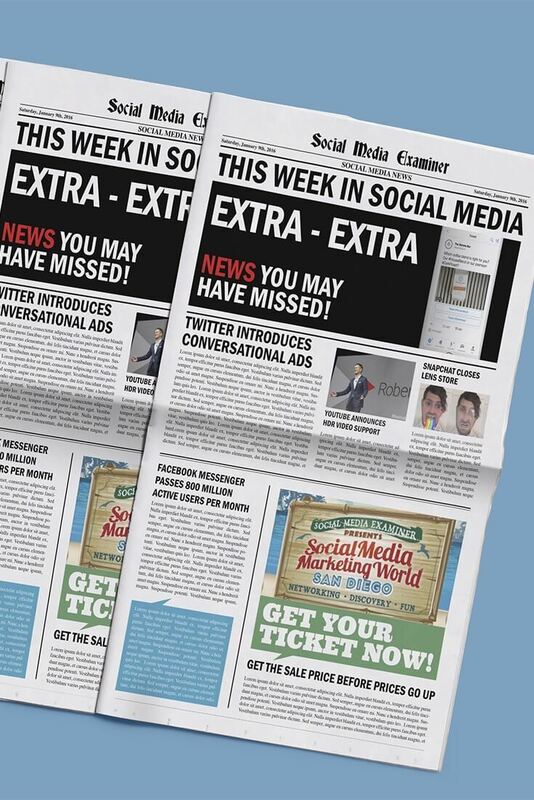 Twitter Launches Conversational Ads and other social media news for January 9, 2016.